Few things are more satisfying than biting into a sweet, juicy fruit on a hot summer day, so many are surprised to learn that citrus is actually seasonal to winter. And given the general sparseness of produce this time of year, anything remotely fresh is certainly a welcome ingredient! Additionally, while creamy Mexican avocados are available steadily year-round, the California avocado crop actually arrives in February. Together, these ingredients can create some show-stopping winter salads. I recently enjoyed my own spin on this dish–a citrus, avocado, and radicchio salad, drizzled lightly with olive oil and champagne vinegar, and finished with a sprinkle of salt and pepper (pictured above, inspired by Mark Bittman’s Kitchen Express). It was the perfect accompaniment to homemade black bean soup (also from Mark Bittman’s Kitchen Express). After perusing the web, I came across several other variations of winter salads that incorporate both citrus and avocados. Check out the recipe round-up below! For more winter salad inspiration, check out my Fall & Winter Salads Pinterest Page. What’s your favorite winter salad combo? Winter tomatoes are forgettable at best, but oven roasting these greenhouse-grown rubies can help bring out the sweet flavor that we remember from sunny August days. And naturally, there is no better way to use roasted tomatoes in January than to make tomato soup. 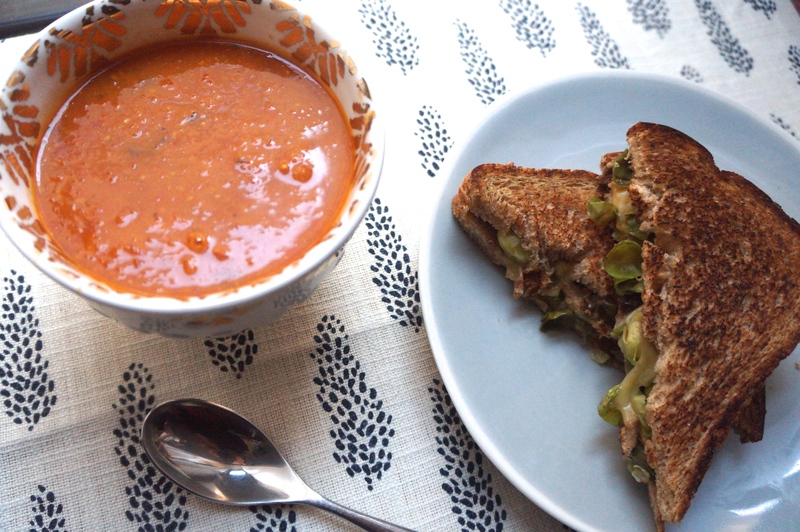 To ease myself back into the Boston tundra (goodbye, 70 degree Houston weather), I made a Roasted Tomato Soup with Sole and Monkfish and paired it with Balsamic Brussels Sprouts Grilled Cheese Sandwiches. For the soup, I used the Roasted Tomato Soup with Halibut recipe from Giada’s Feel Good Food (this recipe, without the pasta) and replaced the halibut with sole and monkfish, which is what I had on hand. 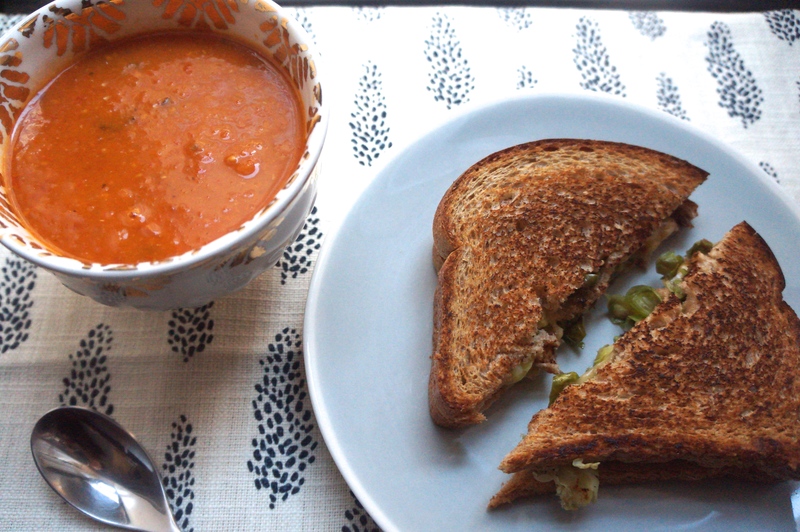 For the sandwich, I used this recipe from How Sweet Eats. A study actually compared the metabolism of a cheese sandwich with whole grain bread and real cheese (Sargento medium Cheddar slices) to a cheese sandwich with white bread and a processed cheese product (Kraft Singles). Scientists found that people expended 50% more energy metabolizing the whole foods version, even though both sandwiches had the same amount of calories and the same ratio of bread to cheese. 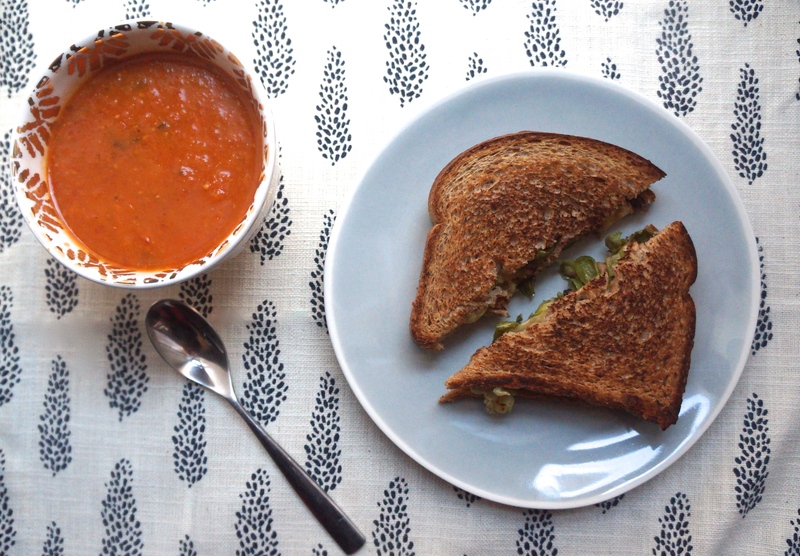 Not only does this grilled cheese sandwich boast 100% whole grain bread and real, organic cheese, but it even has green vegetables on the inside! Paired with a nutritious tomato and fish soup, I’ll chalk that up as a sensible dinner. 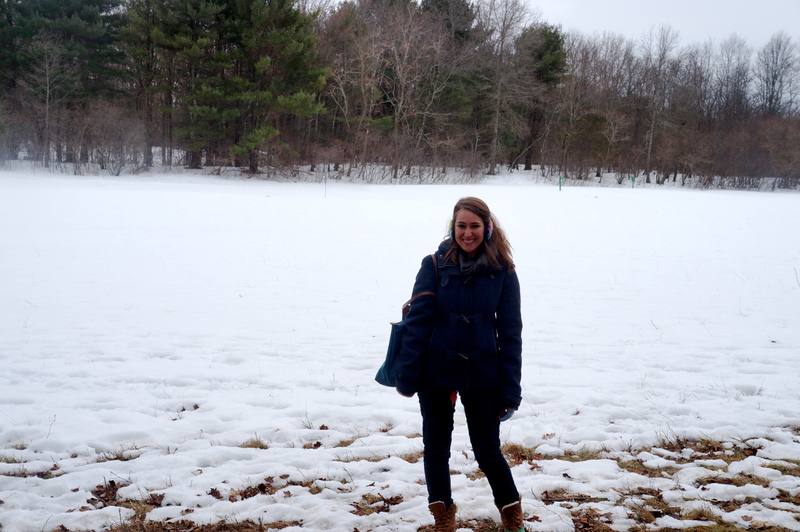 Maple syrup is an iconic product of New England foodways, so I was especially excited to go on the BU sustainability field trip to Mass Audubon Ipswich River Nature Reserve last weekend. 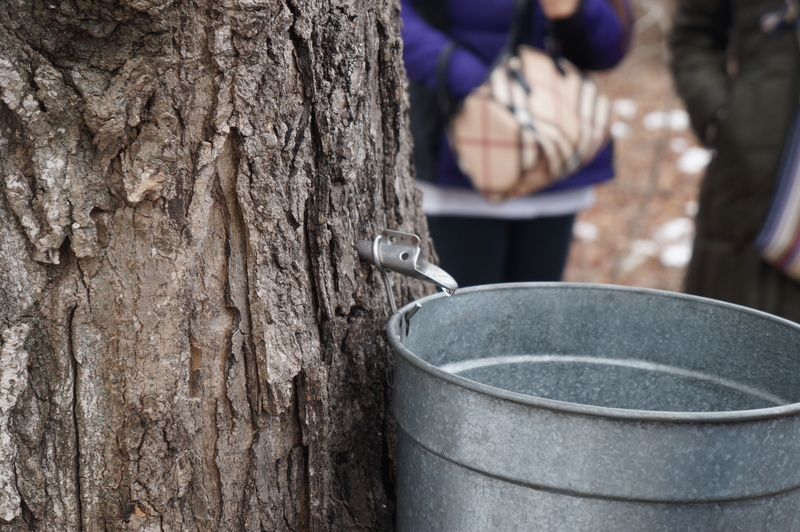 This FREE field trip was open to all BU students and included a guided tour of the maple sugaring process, followed by a pancake breakfast on the property. The tour was entirely outdoors, so we did some hiking through the snow as our guide showed us how to get from sap to syrup. Ever wonder how maple syrup is made? It’s a fairly straightforward process, but extremely labor intensive. The first step is to tap the tree, which simply means drilling a hole and attaching a spout for the sap to drip and collect into a bucket. The number of taps in a tree depends upon its size, and even the oldest, largest trees at Ipswich River Reserve do not have more than 4 taps, so as not to compromise the tree or sap production. Trees have to have reached a certain size before they can be tapped (about 10 inches in diameter) and are often at least 40 years old. The metal buckets that collect the sap are emptied about every 6-8 hours, depending on weather conditions. The sap itself looks and tastes like water (yes, we tasted it! ), and is only about 1% sugar. It takes about 86 gallons of sap (at a 1% sugar concentration) to produce 1 gallon of maple syrup. No wonder it is so expensive! But how does the sap get turned into delicious maple syrup? All you need is heat. After the buckets of sap are collected, they are brought to the “sugar shack” to be heated up. As you can probably tell, the sugar shack is a steamy little cabin that houses the machinery. 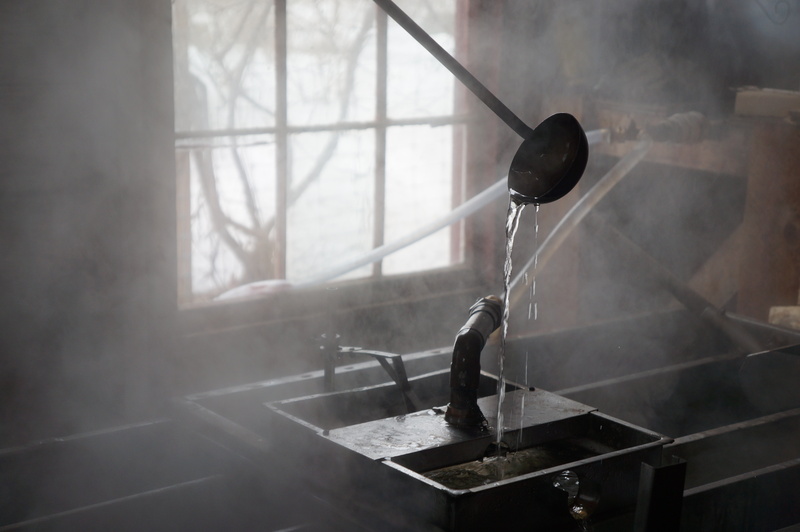 The sap is simply poured into a tank where it is heated up to just above boiling, so that the water evaporates out. Nothing is added to the sap. It is simply a matter of evaporation. Once the liquid reaches the desired temperature, you have maple syrup! No additives needed. 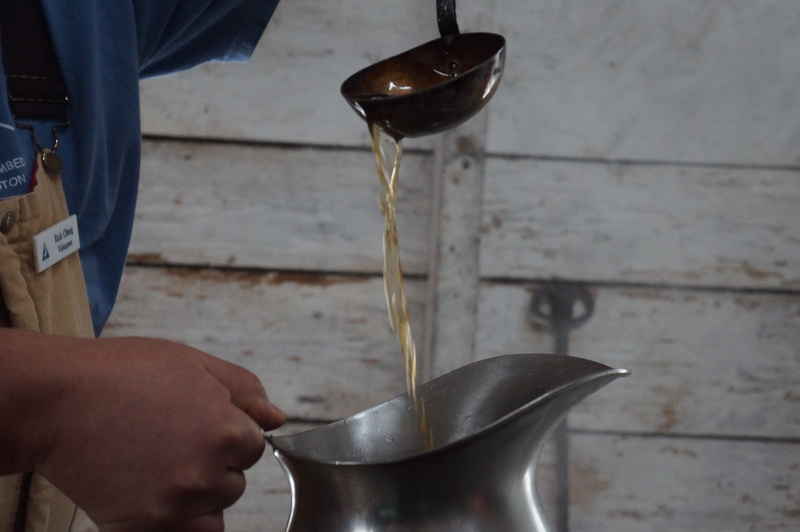 After leaving the sugar shack, we were greeted with a sample cup of freshly made maple syrup. 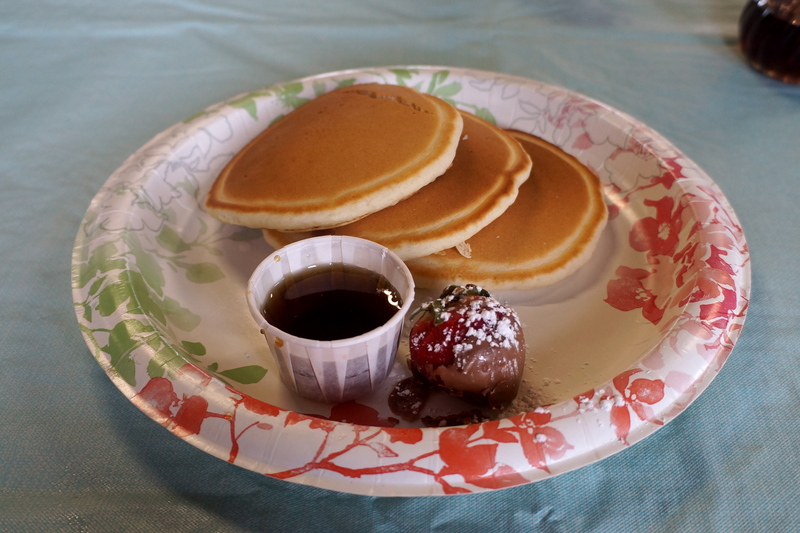 Things got even sweeter as we went into the barn for all you care to eat pancake breakfast. 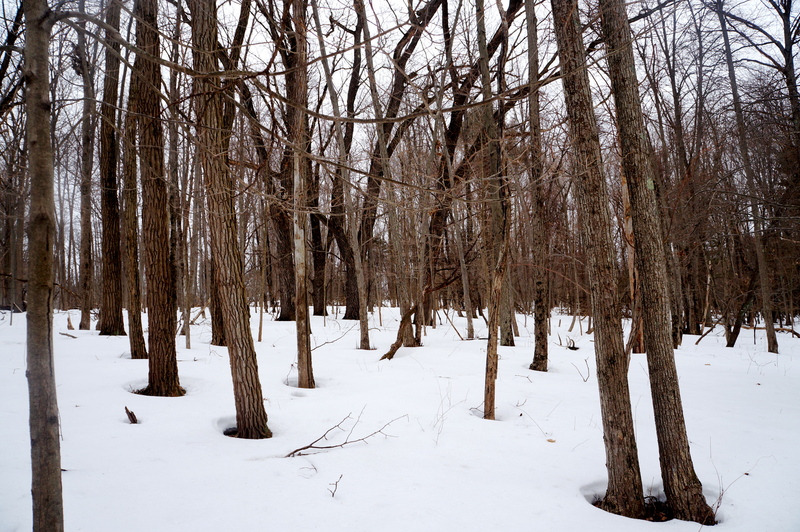 It was the perfect way to warm up and refuel after a chilly hike through the maple forest on a cold February day. Before leaving, I was sure to purchase my own bottle of locally produced maple syrup from the gift shop. After learning about how much work it is to produce, I have a much greater appreciation for it! You may be wondering what the difference is between the different grades of maple syrup. The lighter syrups (Grade A: light and medium amber) are made earlier in the season, and the darker syrups (dark amber and Grade B) are made later in the season. The difference is simply due to the temperature outside. Before my field trip, I always assumed that Grade A was superior. After all, that is how it works at school, as well as in the grading of other food products, such as eggs. But in the world of maple syrup, that is not always the case. 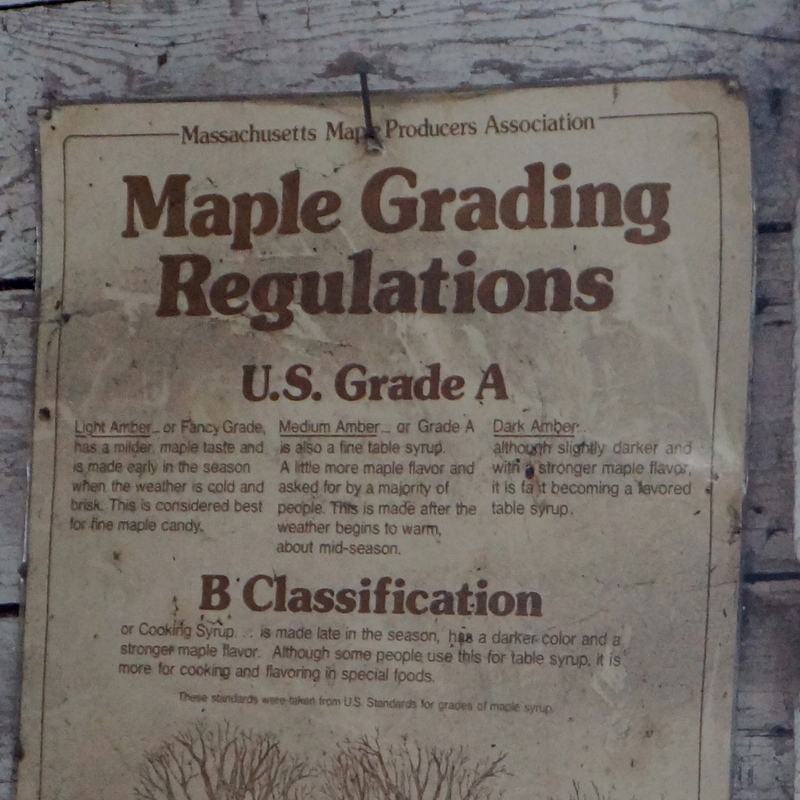 Grade B maple syrup has a more distinctively “maple” flavor, and is often called cooking syrup for this reason. So the grading scale is purely a matter of taste preference. 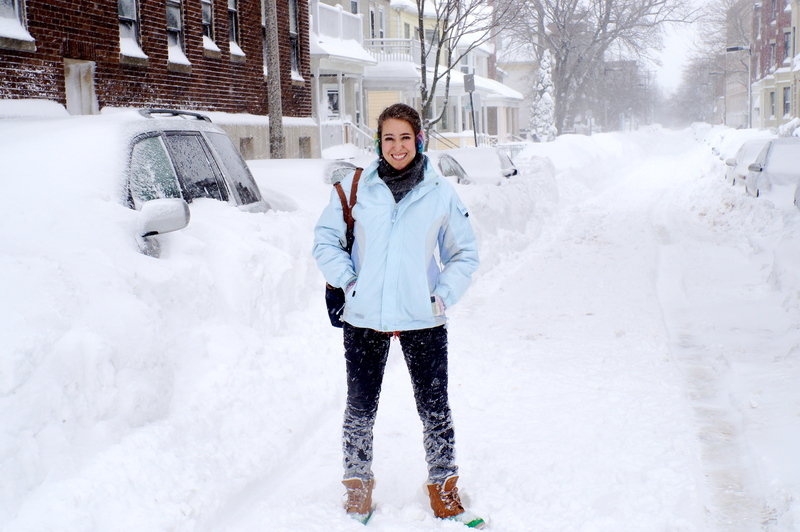 Check out another Gastronomy student’s take on the day in this BU Gastronomy blog post. Check out my blog post from this fall to learn more about my BU Sustainability field trip to a cranberry bog and apple orchard. My roommate and I scored this orange and cinnamon spiced chocolate when we toured the Taza chocolate factory last month (read about our tour here). Because this particular chocolate bar is intended to be enjoyed as a drinking chocolate (I thought it was just supposed to look like a cute coaster or something!) we were saving it for a snowy day. 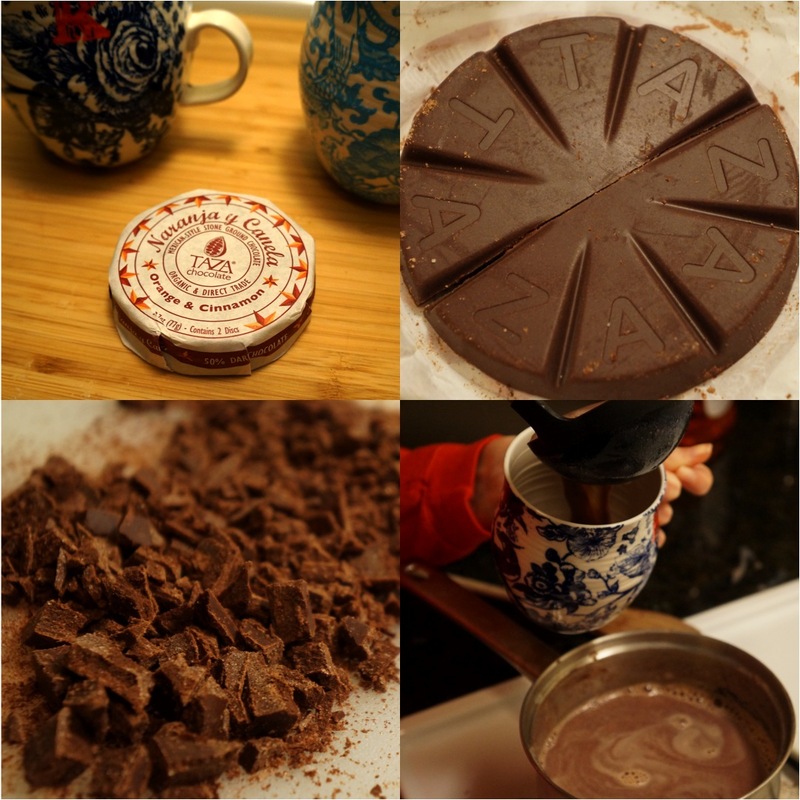 Taza chocolate is organic and direct trade certified from small producers, and is made right here in the Boston area (Somerville). I think we picked the right day to pull it out… wouldn’t you agree? I have never really been one to look forward to exercise. I’ve never been good at competitive sports, and sweating just isn’t my thing. But as I’ve gotten older, I’ve come to appreciate the benefits of exercise. By my senior year of college, I was a regular at group fitness classes (dubbed “Texercise”), I went on semi-regular jogs, and I even took a cardiovascular and weight training PE class for credit. Not exactly fitness inducing weather. While I have been able to go for some scenic jogs around my new city, and even participate in a 5K, winter in Boston isn’t calling me outdoors. So what’s a girl to do? 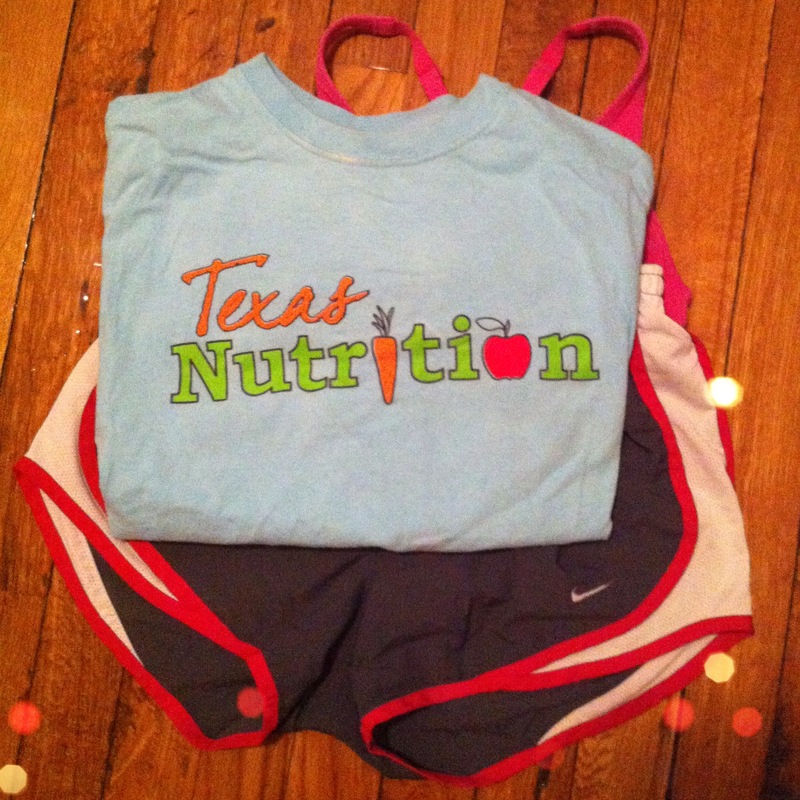 The group fitness classes that I grew to love (okay, like) in Austin are an option, albeit, a pricey one. And on top of working 4 days a week and taking graduate courses, I don’t have the luxury to pick from a variety of classes like I did in college. My only workout options are before work, after work (only on non class days), and weekends. I decided to give work out DVDs a try before work. The workouts I choose last between 35-45 minutes. It’s enough time to work up a sweat and lift my mood, without wearing me out so much that I am tired throughout the day. The purpose is to energize me at work and to start my morning in a healthy frame of mind. 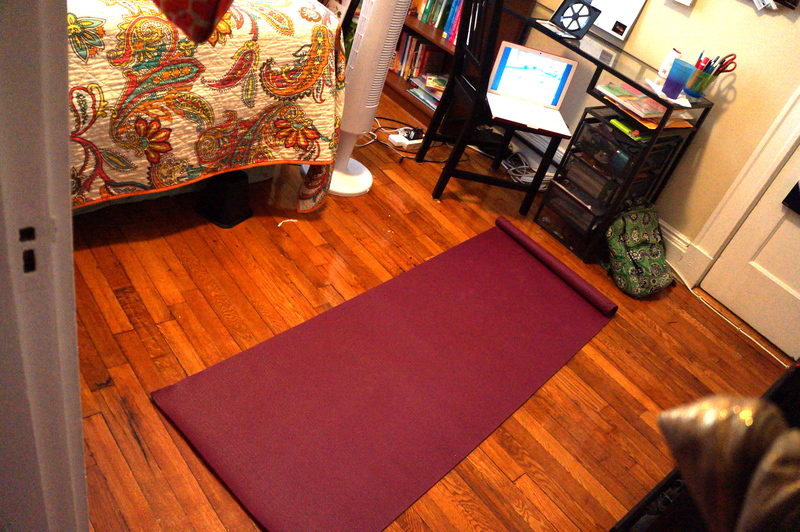 The yoga DVD (Jillian Michaels, 2nd from top) is great for small spaces (see below), and doesn’t require any additional weights. The top DVD has a kickboxing segment that I really enjoy, even though it is a bit of a tight squeeze in my small room. I like workout DVDs because they are an inexpensive way to get guided fitness training, without the hassle of transportation to and from classes, or having to work around a busy schedule. Go to bed on time. If I am ever tempted to turn off the alarm and go back to sleep, it is not because I am bored by my workout, it is because I am tired. Aim for 7-8 hours each night for optimal performance. Don’t make it optional. Decide that you are going to workout, and then follow through. Don’t leave it up to the condition of whether or not you will feel like it. 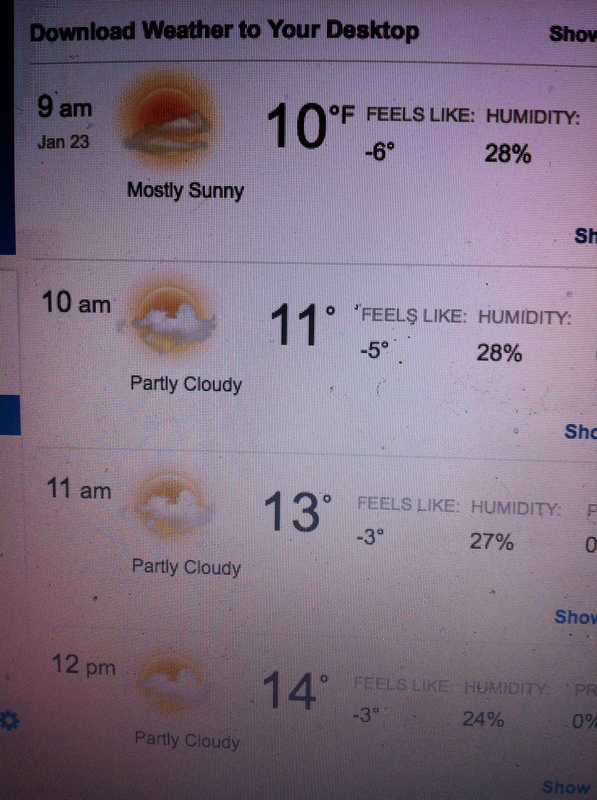 Don’t give yourself a choice to stay in bed. Turning on my bedside lamp when my alarm goes off is a signal to myself to get moving. Prepare the night before. Before you go to bed, clear out your workout space and set out your DVD and a water bottle. It also helps to sleep in your workout clothes. I sleep in a sports bra, T shirt, and Nike shorts each night, so that I am ready to get moving in the morning. Also, just in case you were wondering, I eat breakfast AFTER my workout because 1) multiple studies (here and here) have shown that exercising on an empty stomach burns more fat, and 2) I’m not doing anything that requires an intense amount of fuel or endurance. I will say that this approach is not for everyone, particularly not endurance athletes. For more on sports nutrition, I highly recommend Nancy Clark’s Sports Nutrition Guidebook. What are your secrets to a successful fitness routine? Are you a morning warrior, or do you prefer a different time of day? Also, if you know of any good YouTube workout routines, or other fitness DVDs suitable for small spaces, do tell!